In honor of Pinch Penny Pub’s 14 Annual Polar Bear Party being a little more than a week away, I thought I would offer a little reflection on the big event. After all, it is one of Carbondale’s largest events, garnering not only local media attention, but regional as well. Thirteen years ago, Pinch Penny Pub’s management was approached by Corona about putting together a special cold weather themed event to help them move their product. As the story goes, Corona wasn’t selling as much product as they would have liked in the winter months and needed a boast of sorts from the bar community. So upon being pitched the idea, Pinch’s management came up with the idea of doing a cold weather event called “Polar Bear.” The idea was to open the beer garden, which is usually utilized during the warmer months, and offer deep discounts on Corona products for those in attendance. As you can probably tell, the event took off better than anyone could have guessed. As a matter of fact, over the last few years, Polar Bear has become so large that it takes two different venues to house the crowd, Pinch Penny Pub and Copper Dragon. Pinch Penny Pub offers a nice spacious outdoor location for the event, whereas Copper Dragon is more a warm escape for those that would like to drink on budget while enjoying some of the hottest cover bands in the region. Both venues have their perks, and it just wouldn’t be a true Polar Bear experience if you had to choose one or the other. Personally, I like to spend most of the day at Pinch Penny Pub then as the temperature drops, head over to Copper Dragon to warm up and enjoy live entertainment for the rest of the night. As with any success business venture, you’re bound to see imitators coming out of the woodwork, and Polar Bear is no different. After Polar Bear began to pick up steam, competing bars that wouldn’t give a second thought about taking part in the event themselves, started to look for ways to capitalize on the event’s success. The now defunct Gatsby’s II tried to counter Pinch’s Polar Bear event for a couple years with something called “Tropic Thunder.” Since Gatsby’s wasn’t big enough to compete with the “big dogs” so to speak, they were taking a completely different approach, they were going to offer a warm weather event. That went about as well as to be expected, considering that Gatsby’s II is now out of business whereas the other two bars are still doing fine. Then there is the third approach, mostly taken by the smaller bars in town, which is, if you can’t beat them, grab on to their coattails and enjoy the ride. For the very first year in memory, Hangar 9 is specially billing their events for that weekend with the “Polar Bear” name. Are the events “official” Polar Bear events, not in the least. But it’s a way to convince people who wouldn’t ordinarily come to their venue to give it a shot. Is this considered smart marketing? Maybe. Is it moral in the least? Not at all. If you can’t build your business up enough to attract a satisfactorily amount of customers by yourself, then you need to hire a new marketing team. The way I look at it, and yes, Soberly Intoxicated is getting paid by Pinch Penny Pub to promote Polar Bear, is that Pinch and Corona together build a massively successful event. None of the other bars or businesses pitched in at the time to help it grow, so why should they get any of the notoriety from it? It’s one thing to get overflow from the event, which does happen quite frequently due to the amount of people that regularly attend the event, but why go out of your way to “trick” people into thinking your business is part of it? Why not break from the pack and create something different? So It does tend to get on my nerves a bit when people consider outside events part of “Polar Bear.” I’m not speaking for the bar themselves, I’m speaking from an insiders point of view. It’s actually very common to plan an event and watch others piggyback off of it. If you don’t believe me, just watch what happens right after we announce a new event. Usually one of the other bars will “create” an opposing event right after. Need examples? I’ve got them. I’m just not in the mood to go into that right now, as I’ll end up getting more off track than I already am. My point being that if you say the name “Polar Bear’ remember that you are talking about Pinch Penny Pub’s Polar Bear Party, not someone’s else’s piggybacked event. If you are referring to “Puck Finch” then call it “Puck Finch,” and so on. This isn’t meant to be a knock on any of the other bars in Carbondale, it’s just meant to clear the air about Polar Bear. I’ve worked with just about every bar in Carbondale at some point or another in the areas of promotion, event planning and marketing, and I will say that each bar in the area has it’s own special qualities. For example; Sidetracks is a blast to visit with a small group of friends or on sports nights. They have some of the best bartenders in the area, and they are known for shooting it straight with you. So you don’t have to worry about fake personalities or any of the link. Tres Hombres, for example, offers really good margaritas and Mexican cuisine in an intimate environment. We are still awaiting the full details for this year’s Polar Bear event, but so far it looks very promising. 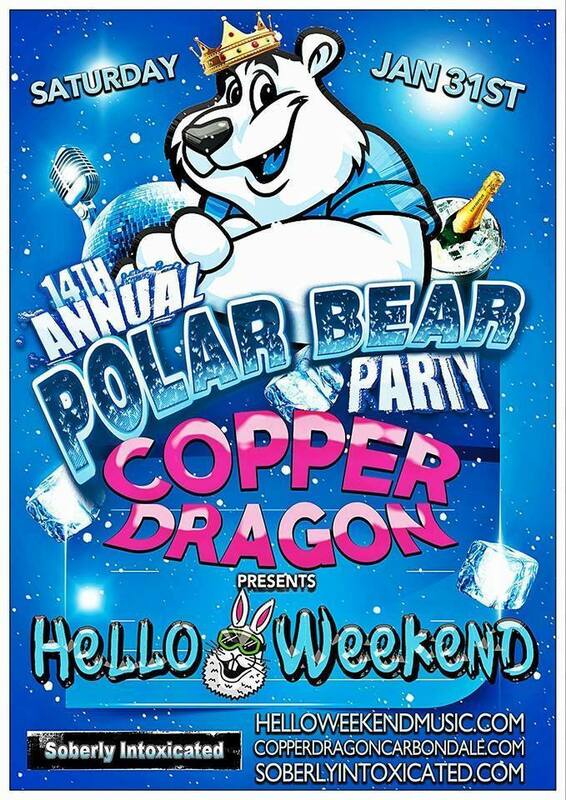 On Friday, Jan. 30, The Hot Sauce Committee will be playing a very special Polar Bear Pre-Party at the Copper Dragon. You may remember that The Hot Sauce Committee played Polar Bear the past two years and have really grown with the event itself, so I have very high expectations for this show. Cover for this show will be $5 a person and doors will open at 10 p.m.
Polar Bear 2015 will feature not one but two different bands, Party Pants and Hello Weekend. Party Pants is a local band from Pickneyville, IL, and Hello Weekend is a party band based out of Chicago. I’ve heard good things about Hello Weekend, so I’m really interested to see what they bring to this year’s event. It’s been rumored that they like to use confetti in their shows, so be prepared. I’ll have more info posted on the Polar Bear section of SoberlyIntoxicated.com as I get it.